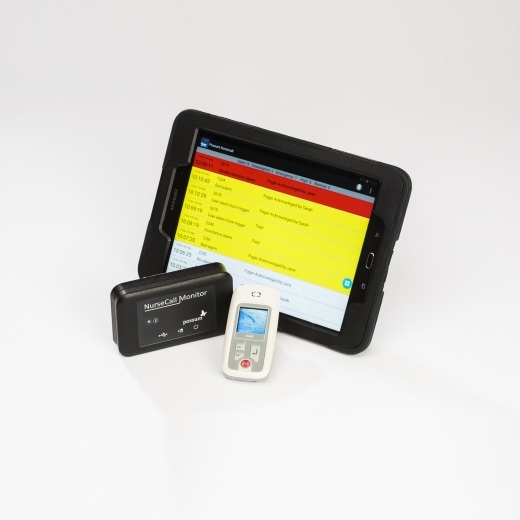 ProTECtor is an integrated solution for staff safety, raising alarms in the case of an emergency, with precise information on the location of the caller. The care staff member carries a pager which has the capability to raise an alarm if required. This alarm then goes to other pagers in the system notifying the position of the staff member requesting assistance so the other staff members can go to the right place to help them. The Nurse Call Logger records alarms that have been raised. The person responding can add notes to say the issue has been resolved, providing a permanent information trail. Compatible with our full range of Technology Enabled Care systems. Cheaper and easier to install than wired systems. Can be easily expanded to include new members of staff or additional equipment. We can offer Service Level Agreements commensurate with the system. IR limited to line of sign to detectors. No redundancy when system malfunctions.